The World Ag Expo in Tulare is the largest agriculture expo in the world! But don't worry, we've broken it down. 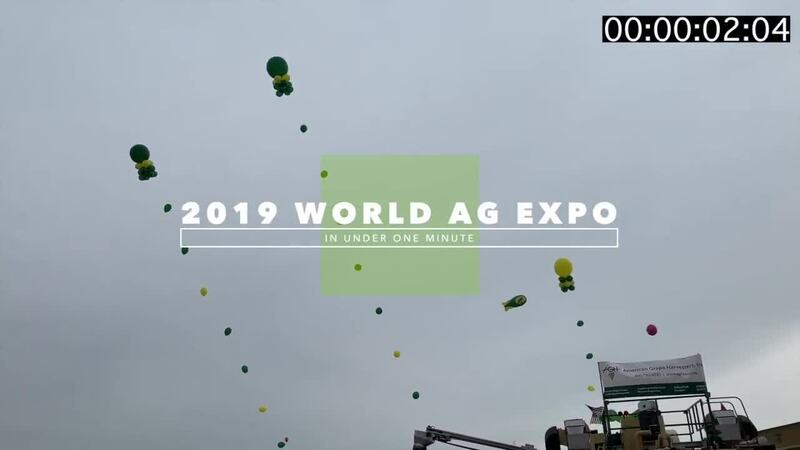 Here's all you need to know about the 2019 World Ag Expo in under one minute. TULARE, Calif. — Thousands of people have gathered in Tulare for the world's largest agriculture expo to discuss the latest and greatest in the world of agriculture. The 2019 World Ag Expo kicked off yesterday in at the International Agri-Center. This is the 52nd year for the expo, which aims to highlight the latest advancements surrounding farming, such as technology and conservation. Jennifer Fawkes, World Ag Expo Marketing Major, says this year's expo will focus on technology for farmers. Over 1,450 exhibitors will have their advancements on display throughout the 2.6 million square foot exhibition space. One of this year's exhibitors includes NASA, who yesterday announced that through one of their pilot programs, they have been able to help California farmers detect how much water their crops actually use up to a quarter of an acre in order to help California farmers better use water. The 2019 World Ag Expo starts on Tuesday, February 12 and runs through Thursday, February 14. The grounds are open from 9 a.m. to 5 p.m. on Tuesday and Wednesday and 9 a.m. to 4 p.m. on Thursday. Tickets are $15 per person, however children 6-years-old and younger are free. The International Agri-Center is located at 4500 South Laspina Street in Tulare.